Dueling Fiddles performs at Beaverdale Farmers Market on Tuesday, July 26 from 4:30-7:30 p.m. 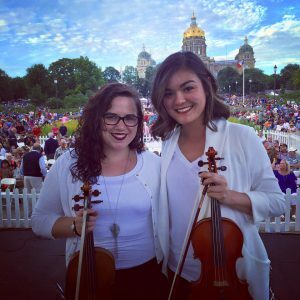 These two violinists, Geneviève Salamone (The One-Woman Symphony) and Hanna Wolle, debuted as a duo at the Celebrasian Festival in May. They played with the Des Moines Symphony Orchestra at the Yankee Doodle Pops concert at the Iowa State Capitol before an audience of 100,000 people. In the style of “dueling pianos,” this fiddle duo provides a repertoire consisting of World fiddle music, Gypsy, Celtic, Pop, Rock, Latin, Klezmer, Irish, Bluegrass, and Classical selections! Musicians at the market play for tips, so please show your appreciation for their talent, stamina and musical artistry. Read more about them on the web and on Facebook.